In the cool of early morning on July 22nd Emmy and I walked through the historic centre of Tuy on the Spanish side of the Miño River. The alleys were deserted. Our voices and footfalls bounced back at us off high stone walls. The fortress-like cathedral stood hard and square against the pale blue of the dawn sky. A ginger cat slinking low across the flagstones froze mid-step to stare. We picked up the Camino and followed it down a narrow staircase through a roofed passage known as the “Nuns Tunnel” into a small maze of lanes that twisted among the town’s oldest residences. After half an hour we emerged into woodland and followed a sandy path that unrolled upwards into low hills. The walking was easy. Ahead of us we saw a wiry figure with a big camera bumping against his chest. He was wearing a kind of cap with an enormous crescent-shaped visor shadowing his face, but with no crown to cover an explosion of black hair on the top of his head. He kept stopping to cup the long lens of his camera in his hand and aim it left and right snapping pictures. This was Mr Chang, a Korean. He told us that he had been on the Camino for 41 days. Several years earlier he had walked the Via Frances with his wife, but this time she had refused to come with him (wise lady). Alone, and speaking no Spanish at all (“just Hola”), he had walked the long ribbon of the Via de la Plata, the branch of the Camino that starts in Seville in the far south and winds north to Santiago de Compostela through the arid and often hot Mozarabe and Merida regions of central Spain. When he reached Santiago he had walked through the city and on to Finisterre, 90 kilometres away on the Atlantic coast. Then he had doubled back to start yet another walk, this time with Tuy as his beginning point. In a lonely spot amid pine trees, as I crouched drinking deeply from my water bottle, a gentleman from Korea had suddenly asked me a question that I had not yet asked myself, at least not seriously. It was a surreal moment. Mr Chang was delighted. This was the perfect answer for the purchasers of his DVD. But I was left musing. I’m not much given to hard physical challenges – especially of the sporting kind – and I am not a big fan of “adventure” tourism. After falling over and injuring myself in Barcelos I’m no longer convinced that long-distance walking is necessarily good for the health of old people. Nor was I walking the path as a religious exercise (readers of this blog will know I am trying to be a hard-line atheist). But I was curious about the motivations of other pilgrims, and I did enjoy the exotic ambience of Portugal and Spain. I hadn’t finished browsing these thoughts when the Camino took a sudden dip and tipped us into the industrial suburbs of Porriño. For around six kilometres we had grit in our eyes and on our teeth as we plodded past a car assembly plant, a seafood cannery, a cardboard packaging factory, an industrial chemicals refinery, a rank-smelling recycling plant, a vast yard stacked with pre-fabricated building materials, and much more. Smears of signage flashed by on the sides of trucks, smoke rolled across the road, the howl of compression braking preceded long fog-horn blasts. Pilgrims (right) compete with trucks and cars in the dusty industrial estates of Porrino. In his Pilgrim’s Guide to the Camino Portugues, John Brierly describes this portion of the walk as “a long and soulless trek”, but in truth it has a kind of gripping energy that is the very opposite of “soulless”. If nothing else Porriño is a healthy antidote to the escapist romanticism that clings like a cheap perfume to so much of Camino rhetoric. After checking in to our hotel in the functional and rather ugly centre of Porriño, Emmy and I took a stroll down the main street. At six o’clock in the evening the townspeople had not yet thrown off the blanket of their daily siesta. The sun was still streaming across the central plaza but the streets were largely empty. 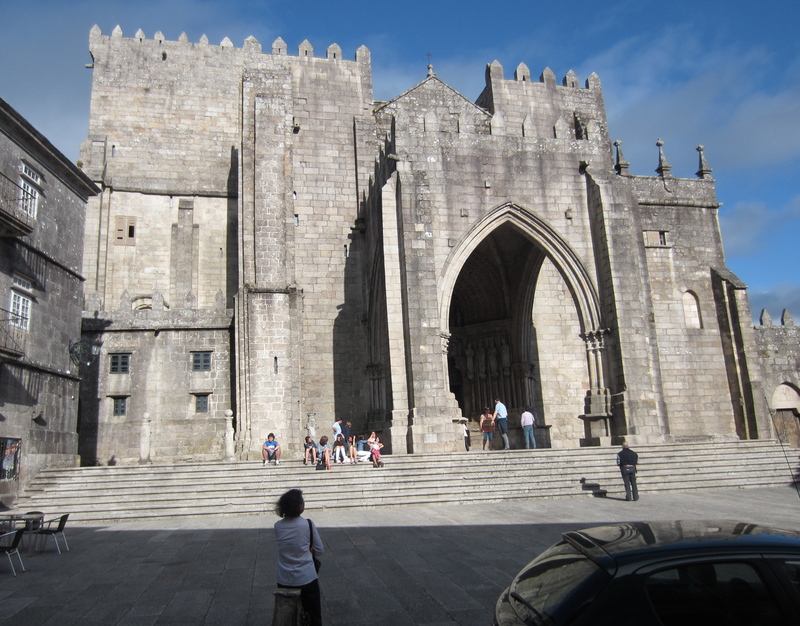 We went into a church – the Igreja Santa Maria – and sat in the dim stillness. A solidly built man, about 30 years old, dressed in black and carrying a Bible, was patrolling the aisles. When I tried to take a photograph he apologised for the poor lighting in the church and hurried up past the altar to flick some switches. We got into conversation (his English was slow but very correct). He was deacon of the church. He had completed six years of study (two years of general philosophy and four years of Catholic theology) in preparation for the priesthood and was hoping to be ordained by the end of the year. I told him we were walking the Camino. He congratulated me on my faith and asked how old I was. I told him it happened to be my 68th birthday on that day. He shook my hand hard and disappeared into a side room returning a moment later with a birthday gift: a small book in Spanish, Evangelio 2011. It contained Bible readings and commentaries for every day of the year. With a practised flip of the hand he turned to July 22nd and translated the Spanish text for me. He threw his arms around me and gave me a big bear hug. As I stepped out into the sun-struck brilliance of late afternoon I looked back at his dark figure standing beside the altar in the dim interior of the church. I was sorry to leave his company. I felt a pang of shame that I had not matched his sincerity with an equal measure of sincerity. I should have told him I was not a Catholic, in fact not even a Christian. I should have told him I did not have any insight and certainly no faith. But my courage had failed me. I had simply tried to make a trite debating point. When he asked me to pray for him in Santiago I enthusiastically agreed to do so. “The sea! 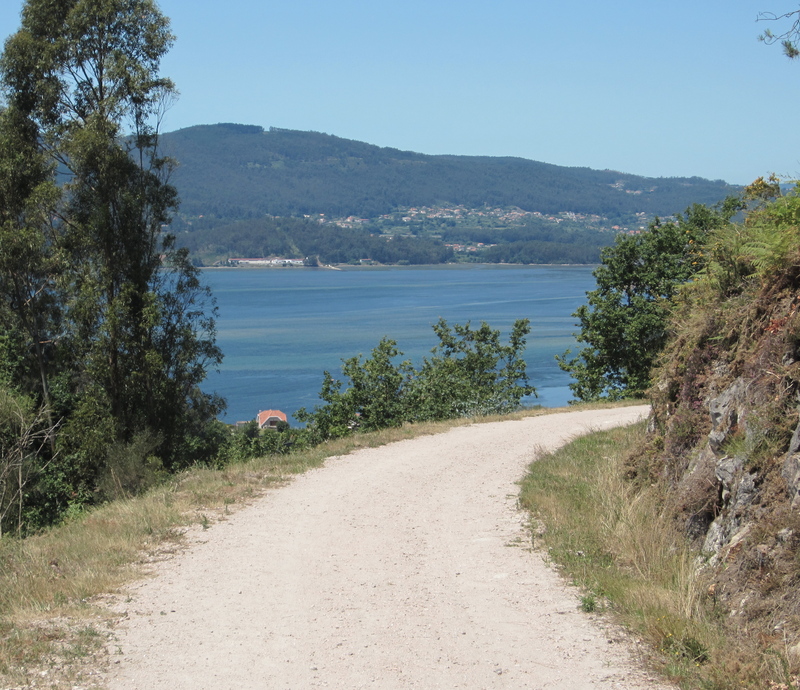 The sea!” The Camino approaches Arcade on an inlet between Redondela and Pontevedra. I was still turning this incident over in my mind the following day, walking despondently and berating myself for my small-mindedness, when the Camino led us out of the hills north of Redondela and opened up a view of the sea. I was reminded of the famous cry of relief raised by Xenophon’s troops as they emerged from the hills of Turkey 2,500 years ago. Instantly I felt refreshed and my stride lengthened. I was on a high as we headed for our night’s accommodation in the seaside town of Arcade.